Cool and refreshing, this orange lemonade is a dose of freshness on a hot afternoon. Fresh mint and ginger provide the extra anti-oxidants. A breath of fresh air on a hot sunny day! In a container add orange juice, lemon juice, ginger juice, and honey. Mix well till the honey dissolves. Thereafter, cut an orange into half and then into thin slices. 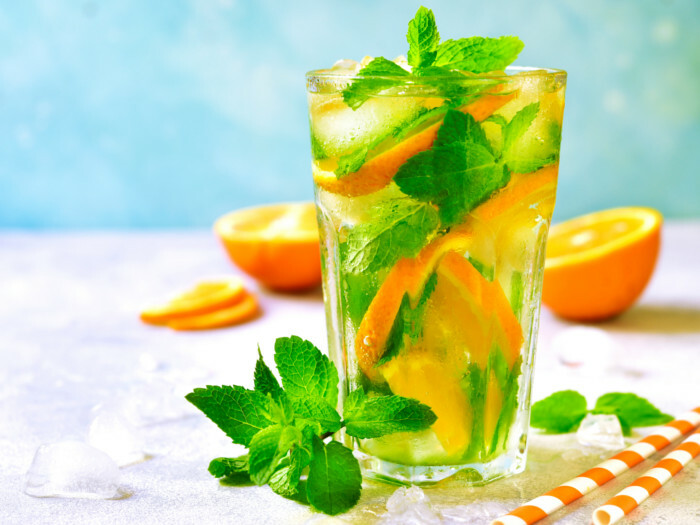 To serve, divide the fresh orange slices and mint between 4 glasses. Add ice cubes if desired. Fill the glasses half with a blend of orange and lemon juice. Top it with cold aerated water. Serve cold and enjoy this refreshing drink! To give this drink a more citrusy flavor, pulpy orange juice would be preferred. Furthermore, it would be better if this beverage is prepared well before it's served as that will allow the lemon and orange juices to blend well with each other. If you'd like to have the juice fizzy, add soda just before you serve.